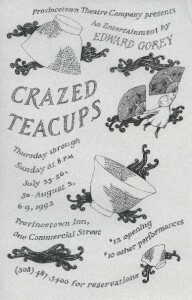 CRAZED TEACUPS is the third and last entertainment Edward staged in Provincetown. It’s also one of his most accessible, dramatizing a number of his famous little books. Along with vignette pieces (The Utter Zoo, Neglected Murderesses, The Helpless Doorknob), CRAZED TEACUPS includes some of his most plot-rich stories: The Gilded Bat, The Insect God, The Hapless Child, The Green Beads. And then there’s the usual assortment of puppet scenes and nonsense advice which he wrote for this show . . . topped off with the loveliest set of drawings that ever dramatized crackle-glazed porcelain. For more about CRAZED TEACUPS, Edward Gorey, and the handmade puppets who performed in his 20-odd “entertainments” at Cape theaters from Bourne to Provincetown, see my nanobiography Edward Gorey on Stage: a Multimedia Memoir. For more about the Edward Gorey House museum, my September ZAPPED reading there, and ZAPPED‘s adventures as a Kindle Scout nominee, see the diverse posts on my blog.